Many types of yoga exist and Hatha Yoga is the component of yoga that gives most attention to the body and is the form of yoga that gives most emphasis to breathing. Hatha Yoga is also an exceptional fitness program. Hatha Yoga is based on the initiative that obtaining extreme control over the body can be the means to control the mind and liberate the spirit. Through poses (asanas), breathing exercises (pranayama), and meditation, Hatha Yoga’s fluent exercises stimulate, and make stronger the whole being body, mind, and spirit. You can start with the physical exercises alone; yet, Hatha Yoga will rapidly begin to show results in other parts of being. Hatha Yoga is intended to manipulate all body muscles, not just a few isolated most important muscle groups as often happens in fitness exercises. Many of Hatha Yoga postures, such as the spine bends and inversions, stimulate particular internal organs or let loose blocked energy from stressed areas such as the neck or lower back. We can say that this is an ultimate full-body workout with fine-tuning exercises. Other fitness exercise courses have a tendency to develop only one part of the body, leg muscles, blood circulation fitness, or fat burning, for example. Yoga includes all of them. Most fitness forms of body exercise highlight muscles work combined with fast, harsh movements. Hatha Yoga avoids such quick movements, which tend to generate lactic acid in muscle fibers, which leads to pain. In addition, Hatha Yoga;s accent on breathing and especially rhythmic breathing brings more oxygen to muscles to further reduce the effects of lactic acid production. 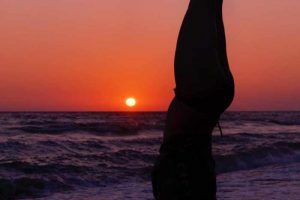 One of the best things about Hatha Yoga as a fitness exercise is in reducing discomfort and muscle aches associated with other forms of fitness exercise, especially in the early hours of a yoga fitness class. Hatha Yoga as a fitness exercise will benefit you in many areas of your life. Hatha Yoga will lower blood pressure, lower pulse rate, and lower respiratory rate, improve blood circulation functions, increase flexibility, increase vitality, lower weight, will improve the immune system, and improve balance and coordination.